This lightweight, folding rollator with a padded seat and removable back support from Drive Medical is very popular - a top seller nationwide. 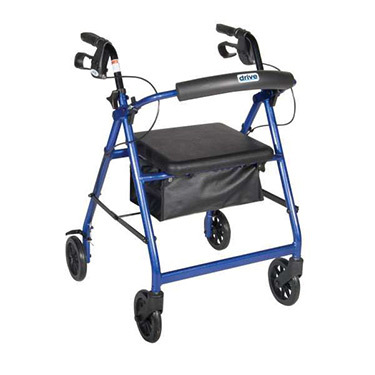 The rollator folds easily with the under seat pouch attached. It comes in five different colors and it is loaded with features! Frame colors: blue, red, silver, green or black frame color. Adjustable height handles allow for the perfect fit. Comes with comfy padded seat and zippered pouch under the seat. 6" casters with soft-grip tires work well for indoor or outdoor use. Width between handle grips: 21"
Pros:Easy to fold....built to fit in most trunks or back of SUVs. Gravity is great. seat with liftup to 'trunk' and trunk holds oxygen tanks, purses, papers, water bottles quite nicely and securely. Like the assortment of colors. We ordered one for car, basement and upstairs in our home. This is the only roolator with a 37 inch height which our PT person recommended for my husband....he was not able to stand tall with others. This rollator is perfect for me. It is lightweight, but sturdy an easily turns on a dime. It adjusts to my height so I am not stooping as I walk. I find this Rollator to be very sturdy, appropriate for my needs, particularly around the house. Only disadvantages would be that it could be higher in overall height, and that it isn't easy to fold up or stand up when going places.